A few stubborn oaks still cling to brown leaves, but for the most part, trees are rid of foliage, giving forests a different look and feel. Landscapes are more intimately studied, their layers and intersections well within view. A low sun pierces empty crowns, illuminating hillsides and unveiling what remained hidden through livelier times. Aerial nests are discovered in shrubs and tree crotches, but none stand out more than those of bald-faced hornets dangling in the mid-story. 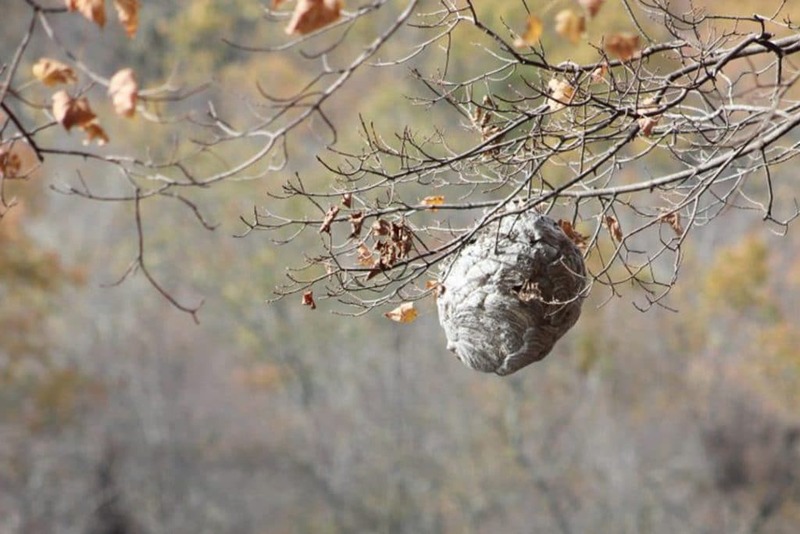 A queen is fertilized and hibernating now, tucked away in the hollow of a tree or stone wall. Come spring she will emerge and predate flies, bees, and other wasps while scouting for a nest site. This fine-scale selection has been of particular interest upon observation that many hives are positioned over water. Is higher humidity beneficial for hive construction and interior environment? Does close proximity to water serve to conserve energy for resource allocation? Is the nest less likely to be predated over a pond edge than within a forested stand? Is the opening of a waterbody creating denser foliage cover on opportunistic limbs? Do queens simply have varying preferences or are nests just more detectable in a more open environment? 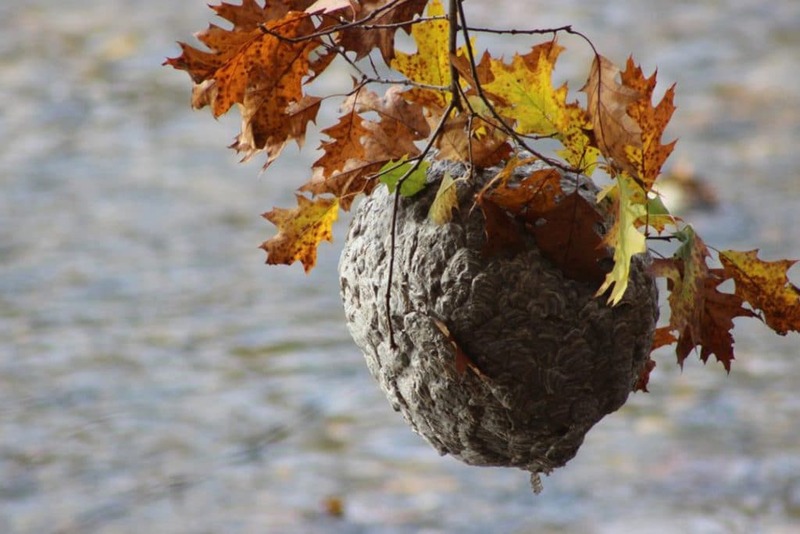 Once a site is picked, nest construction begins with the mixing of wood and saliva – wasp’s paper mache. Both comb and protective paper casing are made with this material to form a structure that enlarges over time to accommodate a maturing colony . One nest may contain several hundred individuals and approach two feet in length by season’s end. With depleting prey and cold temperatures, the queen lays fertilized female eggs and male eggs, which will emerge, leave the nest, and mate before winter. The old queen and the rest of the colony perish while these new females hibernate, dwelling on where to best build a nest, to start the cycle over again.